Post subject: RBotM April 2019 - Theme month - Your favourite lugs!!! A late start to this months competition but here it is. The one you never knew you were waiting for! Save the ear jokes for later and get out there and get a photo. It is exactly as it says' your favourite lugs' or lug more precisely, doesn't have to be intricate or fancy, just why it's your favourite, could be because of the frame it's on, a nice paint job, that type of thing. Take 1 or 2 photos of your favourite lug in your collection/fleet with a brief description of what it's from and why you like it. Totally subjective, and at the end of the month we will all vote for our favourite. There will be a small token prize for the winner. Entries will be open until the last day of the month and then a five day poll to decide the winner. Best of luck and apologies once again for this kicking off so late. Post subject: Re: RBotM April 2019 - Theme month - Your favourite lugs!!! These are my favourite lugs on my 1961 Super Coureur. 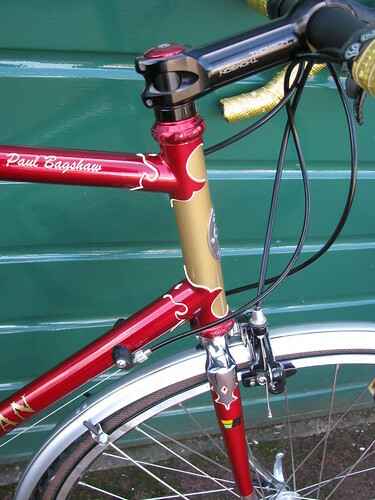 Note these are cast lugs….Not Bi-laminates. Reason why they are my favourite? It’s the feature triangular cut in front. I’m not sure, but I don’t think anyone else bothered with such an intricate detail in a cast lug. Nice idea Jamie, good to see some pretty details…. Mercian 60th anniversay . 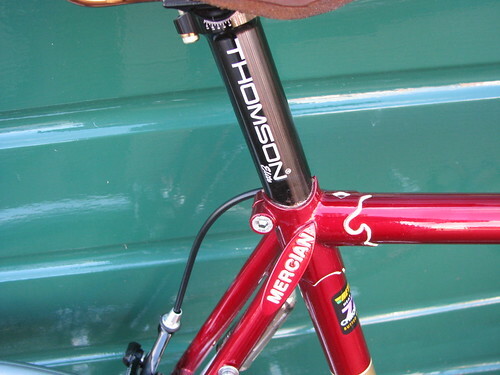 Nicely hand cut and a sloping fork crown at the front whilst the top of the seat tube is finished to match. Only used on this model as far as I know . Nice theme this months. I do not have ambitions to win, due to the faboulus pictures of lugs already shown. But I do like through the years the specific Peugeot lugs. Were the checkered pattern is shown. I do not know another brand which who has such thing as well. A favourite lug of mine too my 1960 track frame has them, was told an interesting story (about them) by Dave Marsh. My favourite use of lugs for the man cave! 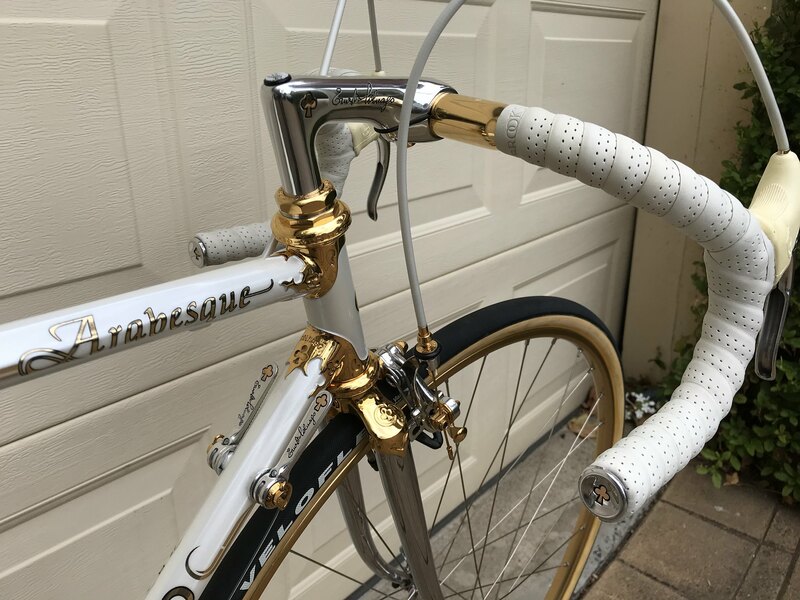 Something not quite so English - Colnago 'arabesque' lugs in 24k gold. The reason these lugs are my 'faves' have nothing at all to do with shape or design, or even rarity. It is simply due to a 'leap of faith' that turned out well. It's a 2017 Colnago arabesque 2nd generation frame that I bought new. Electroplating theory (along with the right chemicals) suggested that it was possible to remove the chrome whilst leaving the underlying nickel plating untouched. So I gently removed the clear coat overlay, masked and effectively disolved the chrome plate, repolished the underlying nickel plate and gold 'brush' plated the lugs. A quick hand sealing metal polish, remove the masking and the job was done. So yes, that is still the factory original paint. I'm pretty happy with my handiwork.